The Dr. Miracle’s 2in1 Dandruff Shampoo and Conditioner is the ideal solution for treating dandruff, and will leave you without an itchy, flaky scalp. It can be used on natural, relaxed, weaved and braided hair. The Thermalceutical Complex combats dandruff and heals dryness, while the conditioner moisturises and gives your hair the ultimate shine. So I took on an offer to try out some of the products in the Dr. Miracle’s range, and I must say, it does not disappoint. 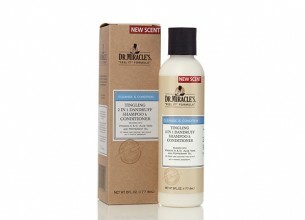 I first tried out the Tingling 2in1 Dandruff Shampoo and Conditioner. You can feel the “tingling” on your scalp almost immediately. At first it’s almost overwhelming and your scalp feels burny as your pores are open and the treatment starts to work. After a minute or two, though, it gets better and your scalp not only feels but looks clean – and good-bye dandruff! Now I take my products with me to the salon!